A fantastic opportunity to buy a front line one bedroom apartment in the luxury complex of Sansofé in Puerto de Santiago. Sansofé is a quiet and residential complex that is very well maintained with a heated communal pool , gardens and also a parking space for when you are using your apartment. This property has one master bedroom with fitted wardrobes , it has patio doors leading to the 12.5 sq m sunny terrace that over looks the well maintained gardens , making it bright and luminous in the bedroom. The kitchen and lounge are both open plan with access to the second small 4 sq m terrace with the fantastic views of the sea , cliffs and of Los Gigantes village. 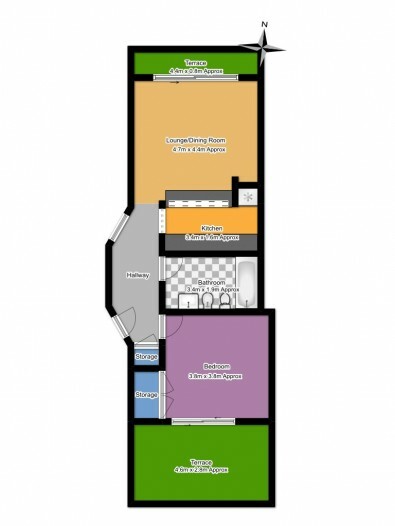 We highly recommend viewings on this apartment to appreciate the complex and the amazing qualities the property offers.